Jerry Henson, a Mark Andy Regional Sales Manager, discusses the opportunities for narrow- to mid-web converters in the growing flexible packaging market. This article was originally published in Flexible Packaging. Find the original article here. The North American flexible packaging market exceeds $30 billion, with the bulk of flexible packaging sales in the value-added segments, including shrink sleeves, pouches, lidding, wraparound labels, etc. There are, however, fewer flexible packaging companies today than there were in 2000, and these companies are producing significantly more product. This creates more opportunity for converters interested in entering the flexible packaging market space, especially if they are able to focus on short- to medium-run work. Narrow- and mid-web converters able to manage these run sizes are seeking new and innovative technologies to make them more competitive. The materials and equipment suppliers are responding, introducing new technologies and techniques that help converters be more competitive and/or expand into new markets. Wide-web technology has improved in recent years, bringing more efficiency to setup times and better enabling these presses to manage shorter run lengths. There is still a point, however, where it is difficult to overcome the costs associated with the setup and preparation of a job on these larger format presses. Plate costs, for example, may exceed 40 percent of the total cost to produce short-run work. Moving from wide- to narrow-web widths offers a potential reduction of 87 percent in total square inches in plate material and sticky back per run, hugely impacting the total cost to produce the job. Ink costs also offer a significant reduction in total job cost. Low-volume ink pans or chambers in the inking systems offered in today’s narrow- to mid-web presses allow the converter to start with as little as 6 ounces of ink to sufficiently cover the anilox and produce a short-run job. Obviously, the amount of ink used depends on the percentage of coverage and quantity of repeats, but the amount needed to start is minimal, bringing ink investment levels down. Plate and ink savings are significant, but not to be left out are the other material and resource savings supported by narrow-web inline flexible packaging production. Setup times on narrow-web equipment can be up to 40 percent less than those on wide web, further reducing substrate waste numbers as well. Finally, labor savings are to be considered with an inline process supporting fewer movements in the operation and less resources to support those movements. 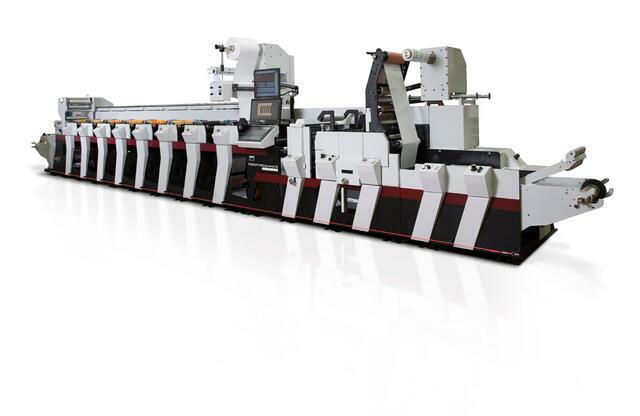 Mark Andy Performance Series P7 flexo press can be fully equipped to support flexible pacakging jobs. Customer demand for single-serve, carry-away packs and easy-to-open packages with unique seal/reseal closures is driving growth in the use of laminating adhesives, averaging 5 percent CAGR globally through 2020.Within this segment, solvent-free laminating adhesives are becoming more and more popular, primarily for sustainability and government regulatory reasons, taking share from solvent-based laminating adhesives. The process of solvent-free lamination involves the mixing of a two-part adhesive at the point of application. This process has been used for years in offline workflows as a secondary operation once the material has been printed, but the additional step in the workflow results in more time and resource waste. While solvent-free lamination is used inline by some converters, it is very rare due to the short pot life (the length of time from mixing until the adhesives are polymerized) of the adhesives. With pot life sometimes as short as 20 minutes, any interruption in the inline process causing the press to be down for any length of time would require the operator to clean up the adhesive station and replenish, resulting in time and material waste. Adhesive specialists Ashland have partnered its Purelam 9500/9240 laminating adhesive with inline narrow-web flexo experts Mark Andy to develop an inline, solvent-free, two-part laminating adhesive delivery system. The successful achievement of this process inline is managed by separating the application of the two parts of adhesive into different application stations. The first adhesive application station, placed after the flexo print stations, applies component A on the topside of the printed base web. The second application station applies component B on the backside of the laminate web. The two parts mix when the two webs are laminated together. With the two adhesive components never touching in the application stations, they remain fluid and usable for many hours, allowing for any unexpected downtime for job changes, maintenance, etc. This technology advancement optimizes flexible packaging workflows by producing fully printed and laminated food-grade packaging in a single pass. It also provides expansion capability into an innovative and more profitable flexible packaging market space, giving these forward-thinking converters a unique position over their competitors. Another area of considerable development is in the commercial availability of low-migration UV inks. Flint Group Narrow Web demonstrated its latest innovation EkoCure ANCORA UV LED inks on a Mark Andy LED-curing press at Labelexpo Americas 2016. These inks, also available in non-LED formulas through Flint’s Flexocure ANCORA offering, have been specially developed for the packaging industry. Regulations are strict, with indirect food contact being dependent upon the barrier properties of the layers of the packaging material, the ink chemistry and curing process, and the extraction properties of the food. Inks and coatings that do not have direct food contact are not regulated as long as there is a functional barrier between the food and the ink or coating, and assuring the inks and coatings do not migrate to the food. Migration is defined as the transfer of substances from the packaging to the packaged food product. While standard UV inks are acceptable for non-food applications where there is an effective barrier (e.g., metal cans, glass bottles), low-migration UV technologies have been introduced to achieve acceptable migration levels on packaging substrates with less effective barrier properties (e.g., thin films, BOPP, LLDPE). 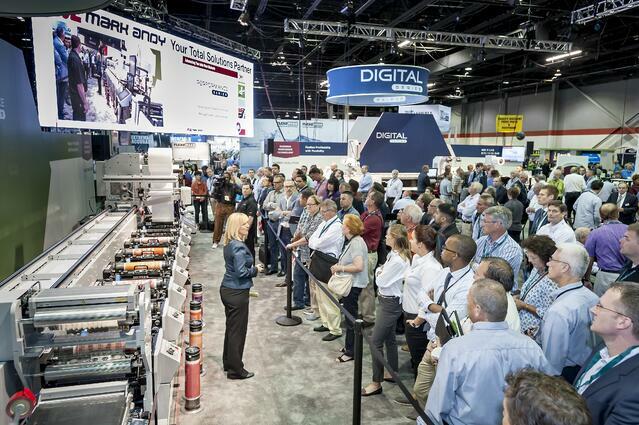 The Mark Andy Performance Series at Labelexpo Americas 2016. There are many advantages of UV ink printing in flexographic workflows, including consistent viscosity, ease of operator use, higher product resistance, more consistent quality and lower emissions. UV ink systems have been in use by the narrow- and mid-web converter for several decades. With the continued development of low-migration UV inks, these advantages can now be utilized by the converter in the packaging industry. Of course, it is always recommended the converter conduct migration testing to ensure compliance. With these advancements as well as others on the horizon, there are more opportunities now than ever before for the narrow- to mid-web converter to enter or expand in the growing flexible packaging market. Opportunities will continue for companies that embrace packaging innovation, sustainability, new manufacturing technology, and drive to find ways to meet or exceed customer expectations. Jerry Henson is a Regional Sales Manager for Mark Andy with over 30 years of experience in the label and packaging industry. Jerry’s background positions him as a great resource for converters, helping them utilize the right technology within the pressroom for a broad range of package printing applications.